To continue the series of articles (Creating banners for Aparg SmartAd with Vectr, How to create attractive banners for Aparg SmartAd with online tools, How to setup banners using Aparg SmartAd WordPress plugin) about helpful and cool online tools for the banners' creation now is the time to reach the field of animated banners and how to obtain them. The number of webpages which still use Flash technologies is falling from day to day. The official "death" of Flash has already felt. One of the first refusers of Flash was the head of Apple company Steve Jobs. Then his act has been followed by many others. But the last and the most powerful hit was done by Google which decided to off the download of flash ads. So, it is not possible to claim that the leaving of Flash from the digital advertising field upset users. Mainly it happened due to HTML5 which has come to replace and become a really strong opponent. HTML5 has a variety of advantages. Like banners of HTML5 format are equally displayed on mobile devices of any brand as in all browsers. Also, it is easily possible to combine HTML5 with different social networks and application to engage the more targeted audience. If you wish you can follow all the stats about views, clicks, regions and mobile devices of these banners by Google Analytics. Unlike Flash's flaw, which quickly discharges the mobile devices' batteries and slows download of the sites, HTML5 doesn't have problems like this. In addition, it is less in weight and has fewer requirements. HTML5 banners' creation is very flexible. It is possible to fill all your wishes (images, texts, links and etc.) with. Surely, the coolest opportunity of HTML5 is the creation of animations. It has proved that sites with quality animation look more attractive for visitors. Basically, the process of making banners is not heavy and may become really enjoyable. 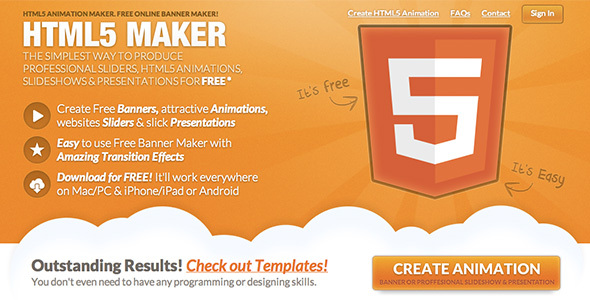 Special for the latter here is the list of three great online tools for animated HTML5 banners creation. Bannersnack is very popular and easy-to-used online tool for the banners creation of any type. As for ordinary banners here is the article which includes the review of Bannersnack and its features. Now it is the time to consider animated banners' making details. The extension provides simple drag and drops function to create a full animation without much effort. 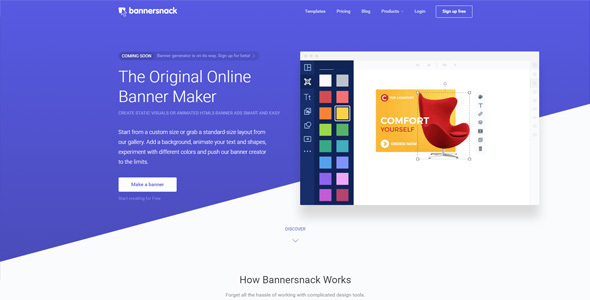 For HTML5 format animated banners, Bannersnack offers the start with already available templates (which has done by professionals) or you can make them from scratch by your taste. The tool has different great options of transitions special for HTML5 animations. Definitely a good choice for everyone from beginners to experienced designers. Bannersnack is absolutely free (you need to pass just the registration). However, for those who want to gain more capacity, there are some monthly and annual types of paid packages. Surely, the annual set will save your money, cause the price is from $7 to $48 per month. While single month will cost from $12 to $69. In all fairness, it worth purchasing! 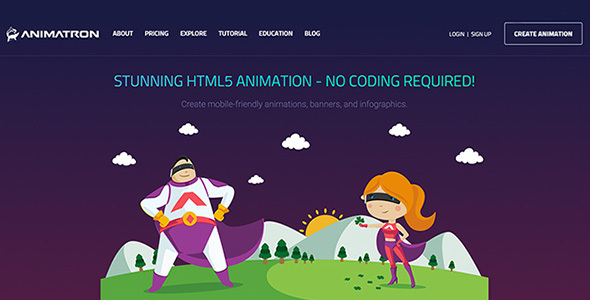 It proposes the set of HTML5 more animation effects, unlimited banner hosting, more fonts and templates and many other things. Next is HTML5maker, which one of the best for the creation of nice animated banners, slide shows and other elements of web design. Animated banners for your ad campaign made by HTML5maker will enrich and do more interesting your blogs due to a juicy set of functions. This tool offers any sizes, background images, plenty effects, filters and other standard settings. The working desk of HTML5maker is convenient and understandable as well. There are layers of the banner on the one side and the basic setting on the other side. Of course, you can insert any images and texts (adjusting their sizes, colors, effects and fonts). Also, it supports a large library of owned images and all common text filters. You can create your own templates and easily share it with friends and colleges via the cloud or directly embed to your website. The work on HTML5maker not only enjoyable but also really time-saving. In general, for the access to the premium offers of HTML5maker, the price of the tool fluctuates from $4.99 to $49.99 monthly. Such helpful and excellent tool! You can make sure by yourself. The last in today's list is Animatron. The intuitive editor for developing and publishing animated and interactive content (like banners, infographics and much more). Perfectly works on all types of devices, from mobile to desktop. It is irreplaceable for animation, videos and GIFs creation. For example, you can draw the elements of animation with different pens, brushes, pencils and other professional tools. It allows you to drag items from the library, graphic vector shapes, import sound, adjust the animation on the timeline. Animatron has colorful and nice templates of backgrounds, objects and sounds. For more information, Animatron has a Youtube channel full of great helpful tutorials. Also, you can make one pilot banner before the registration, just to try the tool and make sure in its convenience. Animatron is a free online tool but for more features, you can upgrade your profile. In this case, the price may be approximate $15-$30 per month. No worries, it will surely be a good choice for you! As it was mentioned the effect from animated ads is impressive and productive. So, when animated banners are ready, it is the time to place them in WordPress websites and blogs to gain money. Aparg SmartAd plugin is proven and guaranteed option for this stage. This WordPress ad management plugin is conveniently compatible with the all listed online tools. Cause there is no need to download prepared banners. Aparg SmartAd offers to place HTML code into an ad campaign and directly receive the animated banner. Awesome, isn't it? Plus, due to HTML code, all current fixes which you do in online tools immediately will be changed in ad campaign too. Aparg SmartAd has three types of the ad campaign. Each of them proposes its own types of ad insertion (images, videos, flash, code or iframe). To place an HTML code you have to choose code ad type. This type of ad provided by embed and popup types. After it, you can choose a preferable position for ads, add special effects for animations and started to follow all information about single ads and whole ad campaign in stats part. 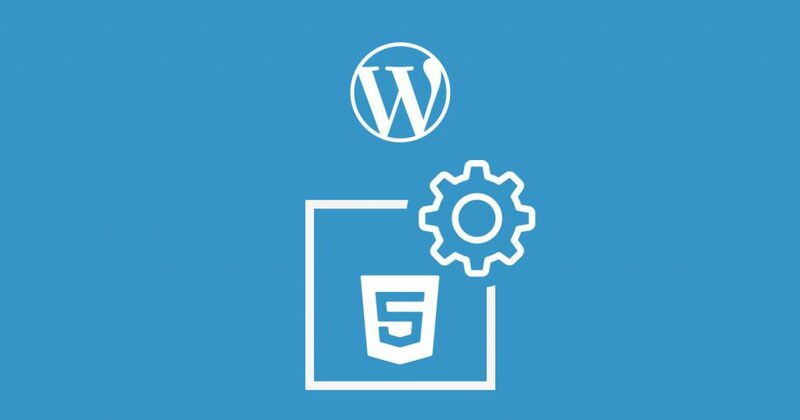 Create HTML animated banner with your favorite online tool, insert it to your WordPress blog via Aparg SmartAd plugin and start to gain big money! You can check out Pixteller for animated banners. Very easy to use and the result I think is exactly what is needed for a banner. And you have full control of what elements to animate and how this should look.